Continuing my rash of late month design challenge reveals, it's time to share what I made for the latest installment in the Inspired by Reading Book Club! You can check out more info about the group (you read the book and create something, anything) over at Andrew Thornton's blog HERE. This month's book was My Mother She Killed Me, My Father He Ate Me, a collection of new stories inspired by fairy tales and edited by Kate Bernheimer. I have been entranced by fairy tales since I was a little girl, so this book was right up my alley. Two of my earliest book memories involve collections of fairy tales. The first was a Little Golden Book called The Blue Book of Fairy Tales that belonged to my big sister Kathy. I was thrilled by the dark artwork and a bit terrified by it actually. (Seriously, look at that witch on the cover...she's scary!) It made such an impression on me that as an adult I spent years combing used book stores and garage sales looking for a copy of my own...and I eventually found one! 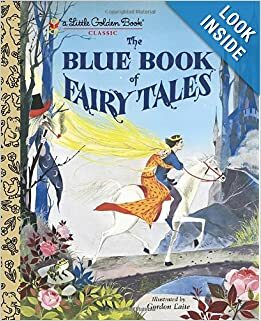 My other early fairy tale memory was devouring the stories in a big fat collection from Readers Digest that my grandparents gave me for Christmas one year called The World's Best Fairy Tales. That volume introduced me to many new tales as well as the non-Disneyfied versions of stories I already thought I knew. As I've grown older, I've developed a notoriously short attention span when it comes to short stories. Despite that, this collection really held my attention and imagination. I only managed to read about 12 of the stories and I was sad that I needed to move onto other things since there were still tales between this book's covers that I was interested in reading. Perhaps I'll check it out again someday, but then again, there are always stacks of new books I want to read! Lots of good elements to work with here... witches, poison, cats, strange "children," and more. Not surprisingly, I found this story unsettling and creepy. While Mother's Revenge, the main cat in this story, was not black like the focal I chose, I decided this pendant from Earthenwood Studio still worked since this could be her silhouette with eyes glowing in the moonlight. I kept things pretty simple for my design, just adding some Czech glass that has some bronzy sheen, rectangular bronzite pieces, and Vintaj brass chain and findings. I also whipped up a pair of earrings based on the same story. I was a little fascinated (and horrified) by how Mother's Revenge directs Small to lock all of the witch's cats inside her house and burn the whole thing down. The next morning when the fire is out, Mother's Revenge retrieves bundle after bundle out of the ashes... catskins that no longer have cats inside. And from the catskins fall golden coins that were "sloppy, slippery with fat." Ok, totally gross, but that's the inspiration for these pretty little earrings made from pearls and gold filled findings. I think I found the perfect prop for them! As always, thanks to Andrew for thinking up and hosting this great book club. One of these days I'm going to plan ahead and take a little mini-vacation for the in person meet up! For now, I have to settle for checking out what everyone else made virtually... I hope you'll take a peek too! Your cat pendants are beautiful! The title of that 1st book is wild, lol. Great piece Sarajo! Although I'm not sure I want to read that story now! I think I love my cats too much, lol!!! Your'e too funny Diana! Your cats could be filled with valuable gold! Just kidding... although one of my cats is now giving me suspicious looks. Love the pendant you chose as your focal and how you highlighted it with your design. Enjoyed reading about your love affair with fairy tales. Meow! Pretty cat necklace, I will have to read that story! I'm a cat-lover and was pretty horrified by the cats being locked up and burnt up, but it sounded like they knew it was coming and helped make it happen... so.... yep, fairy tale logic says it's okay? Your pieces are just fabulous and I think fit the story perfectly. I love Melanie's pendant. She makes such lovely and fantastical creations! And the gold pearls definitely remind me of the coins. You did a wonderful job translating the story into jewelry pieces! Nicely done as always! And thank you so much for participating! I really do value your participation and hope that you guys get to come out one of these days! It'd be so much fun! I remember the first time that I met you guys in person at the show in a school gymnasium and how your husband showed me his "Mystery Nut" pendant that my family makes and how he said it reminded him more of hops instead. If you guys come out, there are lots of local breweries to sample! Plus it's really pretty! Thanks again for participating! I know what you mean about being horrified...many of the tales I chose had that effect on me! I don't know if that says more about the collection or my decision making though. Melanie does do gorgeous work... she's just one of many artists that I'm guilty of hoarding things from. New year's resolution: less hoarding, more making! Love the cat pendant you chose for your necklace: beautiful in its simplicity and bronze color palette. And I am a big fan Melanie 's earthenwood studio. I also enjoyed your chat about fairy tales as a child and the book you found as an adult. You've really made me want to read this book with your recollections of your childhood fascination with fairy tales. We had a beat-up old book of the Grimm's (and they WERE grim!) Fairy Tales and I have to admit that I was mesmerized with the lurid ones like The Little Mermaid and Rumpelstiltskin. I've heard they were meant to scare children into being good and obedient. Probably just turned us all into lovers of all things vampire and creepy. Thanks for the story-- Happy Hallowe'en!! Halloween - Day of the Dead Blog Hop!